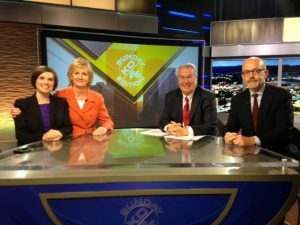 PITTSBURGH, PA – October 17, 2016 – Heather Heidelbaugh, a partner in Leech Tishman’s Government Relations and Litigation Practice Groups and a well-known public commentator on politics, legal matters and election issues, recently appeared on CBS2-Pittsburgh’s KD/PG Sunday Edition show. Hosted by Jon Delano, KDKA-TV’s Money & Politics Editor, and John Allison, Editorial Page Editor of the Pittsburgh Post-Gazette, the show aired on Sunday, October 17, 2016. The show focused on recent events in the presidential election and their effects on the candidate’s respective campaigns, including political fallout following recently-surfaced videotape material from 2005, which included comments made by Republican Presidential nominee Donald J. Trump , as well as the implications of more e-mails from Democratic Presidential nominee Hillary Clinton’s campaign, released by Wikileaks. Heather was joined by Dana M. Brown, Ph.D., Executive Director of Chatham University’s Pennsylvania Center for Women & Politics, and Philip J. Harold, Ph.D., Professor of Political Science and co-director of the honors program at Robert Morris University. Heather S. Heidelbaugh is a Partner with Leech Tishman and a member of the Government Relations and Litigation Practice Groups. An experienced trial lawyer, Heather is based in Leech Tishman’s Pittsburgh office and has handled a wide variety of litigation matters for businesses and individuals. Heather focuses her practice on all types of litigation. She is a member of the Academy of Trial Lawyers and the Litigation Counsel of America, a national legal honorary society.